We have received dozens letters and phone calls from clients of Princess Paulownia, Krushevac with alerts for deliveries of planting material from Paulownia ”Bellissia”, who differs from the original planting material, that we produce. 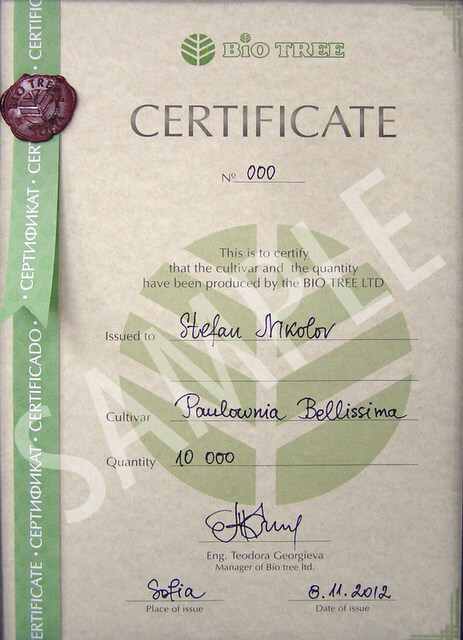 Princess Paulownia, Krushevac guarantee the origin of the material with certificates, that are false and not issued from Bio tree. The clients of Princess Paulownia contact us with many other different complains from them. Since we did not receive satisfying arguments and evidence to support the loyalty and correctness of Princess Paulownia, as of 8th of May 2018 we officially notify you that we will immediately suspend the implementation of the INTERNATIONAL AGREEMENT FOR SALE SIGNED ON 13th of FEBRUARY 2018. During the 2018 BIO TREE Ltd will not make any deliveries of planting material of Paulownia BELLISSIA to PRINCESS PAULOWNIA D.O.O. YOU CAN CONSIDER THAT FOR A FINAL DECISION BY THE MANAGEMENT BODY OF BIO TREE LTD.
You can rely on our support and assistance in search for justice. For further questions, you can visit us at our office where you will be provided with evidence and arguments in support of our decision.